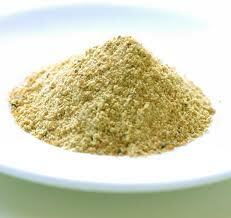 Asafetida (hing) is used as a digestive aid, in food as a seasoning. Its odour, when uncooked, is so strong that it must be stored in airtight containers, otherwise the aroma will contaminate other spices stored nearby. However, its odour and flavor become much milder and more pleasant upon heating in oil or ghee. It has following Health Benefits. For gas and flatulence, you may add a pinch of hing to buttermilk with a pinch of salt and drink it after meals. In case of stomach ache, a little hing should be dissolved in water and the paste should be applied on the navel. A piece of hing (Asafetida) placed on an aching tooth, reduces pain. Raw asafetida may be given to the patients in lung infections like bronchitis in dosage of 5gm per day. It can be fried in ghee and given to the patients suffering from neuro-muscular disorders such as sciatica, facial palsy, paralysis etc. for relief from pain. In breathing disorders such as coughs and cold, it can be consumed in dosages of 12-15 gm for relief. You can even apply hing (Asafetida)on an itching skin for relief. at the sidebar, you can see facebook like page, where you can follow us. Thanks a lot for showing interest and appreciating our effort.